Who can resist a restaurant called "Mom's", especially when the kitchen and waitress staff is a squadron of fifty-ish, motherly types who look like they'd be disappointed in you for not finishing your vegetables. But the main draw here is the sake -- they promise a "journey through Japan by sake", and they stock close to 100 brands, from every part of the country, with most varieties running Y500-Y800 per glass. 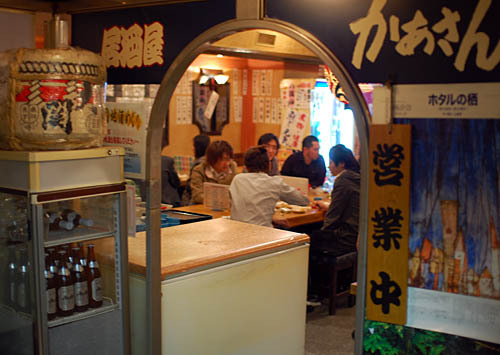 There's also a respectable menu of izakaya-style food, with grilled chicken wings, duck steak, and plenty of seasonal items. No English.